Construction to the Port Miami tunnel has been in full effect and has reached the final stretch. “Port Miami will be one of the only Ports in the world with a direct connection from the Port to the highway system without a single traffic signal,” Port Director Bill Johnson said. The underwater tunnel will soon take cargo trucks and cruise passengers off the often busy Downtown Miami streets and directly to and from the Port. “The importance of an improvement like the tunnel, which is a state-led project, affords the opportunity to move both passengers, cruise passengers, as well as containers more efficiently, more effectively, more safely,” Johnson said. The dual underwater passage goes as low as 120 feet under Biscayne Bay and will have four lanes of traffic, two westbound and two eastbound. 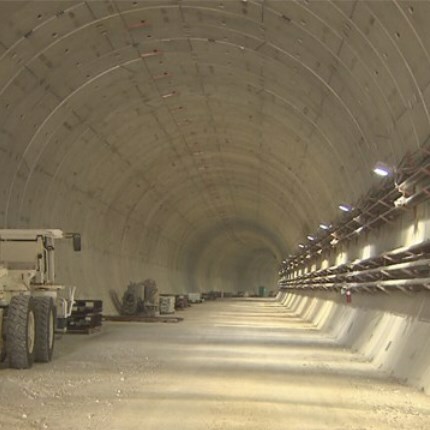 Ninety percent of the tunnel is now complete, though construction of the interior, including lighting, traffic signs, ventilation, fire proofing and five emergency exits still need to be completed. The nearly $1 billion project began in 2011, with workers drilling through 4200 feet under Dodge Island, Watson Island, Biscayne Bay and the MacArthur Causeway during the last six months. “We just cannot wait until the completion and just think about everything it’s bringing to Miami: 250,000 jobs directly and indirectly,” State attorney general Pam Bondi said. The tunnel opens up at the MacArthur Causeway, connecting to Interstate 95. Officials said the tunnel is just short of a mile long and is on budget and on time. The tunnel is expected to be completed by next Spring.